I have been interested in Japanese culture since a fairly young age. I think it may have been either Sanrio or the Japanese animation I grew up watching, but either way, because I love art I was always intrigued by the sumi-e and woodblock prints I would see in books. 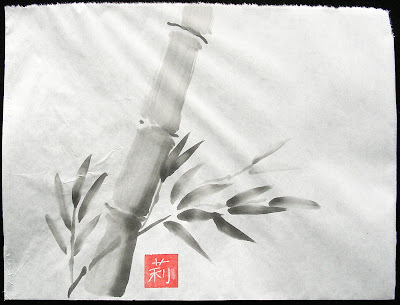 I took a class to learn the basics of sumi-e and found that it's a wonderful, meditative art. It's deceptively simple, because you try to capture the essence of the item in as few strokes as possible. The paper we used was absorbent and the ink permanent, so any hesitation would mean there was a blob of ink in the middle of an otherwise beautiful stroke. It took some practice, but I loved making the ink at the beginning of each session, working on control of the brush, and found that I felt much more relaxed and happy after a session painting sumi-e. The best part is that the finished painting itself also possesses some of those same qualities, inviting peaceful meditation. I recently came across my stash of work from those efforts and will be showing a few here as I become re-acquainted with them.